Sharpen bits, saw blades, knives, and much more! Use them without water or messy oils. 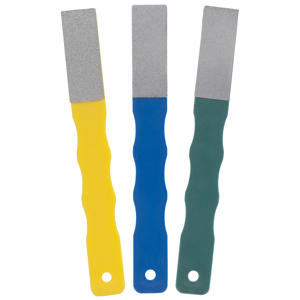 Besides sharpening, the hones are ideal for shaping or touching up glass, fiberglass, stone or wood contours. Hones are approximately 6-1/4" long x 3/4" wide with diamond area 3/4" wide x 2" long. Versatile 4 grit hone allows quick and easy touch up on your router bits, saw blades and cutter knives. 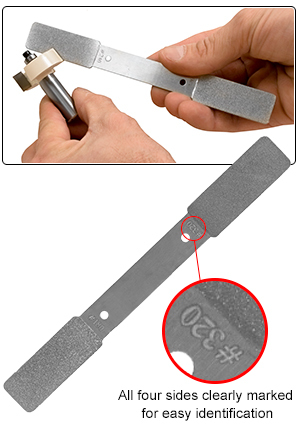 The small 6 1/4" overall length allows convenient deburring and sharpening on carbide or steel cutting surfaces. Steel handle. All 4 grit are clearly marked with corresponding hone for easy identifications.